Show off with our Creamy Chicken Pastry Recipe. 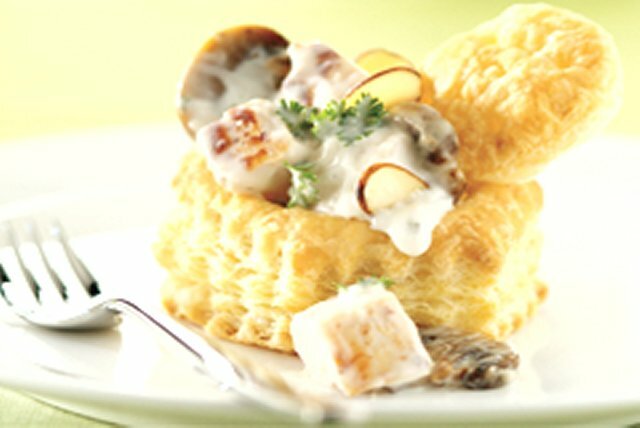 Puff pastries are topped with chicken, mushrooms and a chive and onion sauce in this chicken pastry recipe. Bake pastry shells as directed on package. Meanwhile, melt butter in medium saucepan on medium heat. Add mushrooms; cook 6 to 8 min. or until tender, stirring frequently. Add chicken; cook 3 to 5 min. or until heated through, stirring frequently. Remove from heat; set aside. Heat milk in large saucepan. Add cream cheese spread; cook and stir 2 to 3 min. or until cream cheese is completely melted and mixture is well blended. Add chicken mixture and parsley; cook 2 to 3 min. or until heated through, stirring frequently. Remove center cutout from each pastry shell; set aside. Spoon chicken mixture into shells, adding about 1/2 cup chicken mixture to each shell; sprinkle with nuts. Top with pastry cutouts. Balance this special-occasion dish with smart side dishes, such as a mixed green salad and your favorite hot steamed fresh vegetable. For more flavor, prepare using toasted almonds. To toast the almonds, cook and stir the nuts in skillet on medium-high heat until lightly browned. The natural oils from the almonds will help prevent them from sticking to the bottom of the skillet.